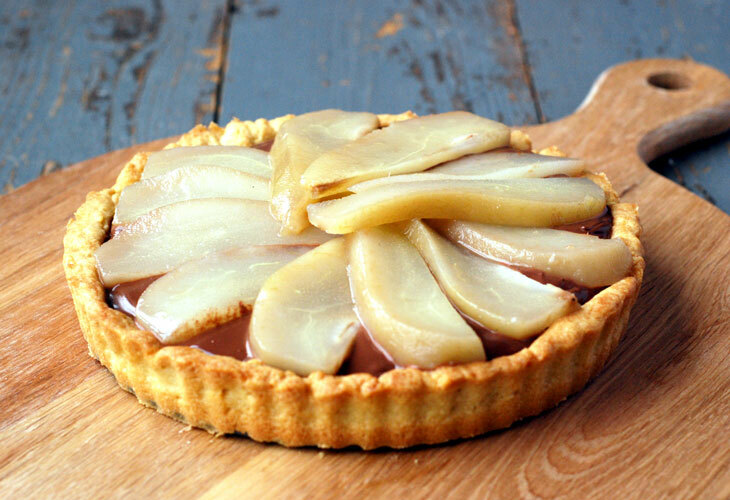 What can I say about this tart – it’s incredibly delicious, sophisticated and a real grown up dessert. You can serve it on its own or if you prefer with vegan vanilla ice cream. The sweetness of the poached pear and the bitterness of the chocolate ganache is a match made in heaven. Believe me, you’ll fall in love with this dessert. Place all the ingredients in a bowl. Using your hands, mix the ingredients until it becomes a smooth dough. Open the dough on to a greased 8 inches round spring form pie pan and bake it for 30 minutes at 180c. Melt the chocolate in the microwave or in bain marie. Pour in the vegan single cream and stir. Add in the port and stir until silken smooth. Take it to the fridge for 3 hours to set. Bring a pan of water to the boil, and then add the sugar, vanilla and cloves. Heat until the mixture is warm and all of the sugar is dissolved in the water. Add the pear and cook in low fire for 45 minutes. Let the curst and pear cool thoroughly before this part of the process. Drain the pear and slice it. Pout the chocolate ganache into the tart shell. Arrange the pear slices in a decorative pattern. Take the tart to the fridge for 5 hours before serving.